After the passing of Jerry Buss, what is next for the Lakers? The NBA has lost one of its greatest owners in league history today. Dr. Jerry Buss, the owner of the Los Angeles Lakers since 1979, died this morning at the age of 80 as a result of kidney failure. He had been in the hospital for months and had not attended a Lakers game all season. There are few owners that have seen the success that Buss has seen during his ownership tenure. The Lakers won ten title during his ownership and became the iconic team in Southern California and known by one nickname, "Showtime." From Kareem Abdul-Jabbar and Magic Johnson to Shaquille O'Neal and Kobe Bryant, the Lakers have solidified their position as one of the pillar clubs of the league and they owe much of it to Buss, a man who came from nothing. Buss was inducted into the Basketball Hall of Fame in 2010. After this sad passing, what is next for the Lakers? 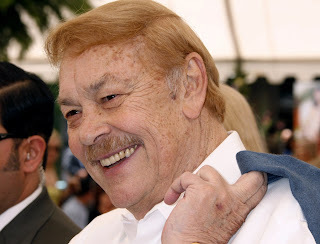 Buss desired that the franchise remain in his family and that it will, as it will appear that the personnel side will be run by his son Jim and the business side by his daughter Jeanie. The former should be cause for some concern as Jim Buss has been roundly criticized as unqualified and not much more than an incompetant person fortunate to be the offspring of somebody with so much. Perhaps the most telling words come from Magic Johnson, who said in November that while he loved Dr. Buss, "I don't believe in Jim Buss." And there could be an internal struggle between those two Buss children. It was reported a month ago that Jim and Jeanie were not talking and had not talked since Phil Jackson, Jeanie's boyfriend, was not hired by the Lakers following the firing of Mike Brown. If those two engage in a battle for control of the franchise, for the franchise's sake and the league's sake, one would hope that Jeanie, who is widely regarded around the league, would come out with control. The future of the team is now uncertain at an inopportune time as the Lakers have been going through a disastrous season after acquiring Steve Nash and Dwight Howard during the offseason and already having one coaching change and it looks like they may not make the playoffs, barring a surprising run. With all the issues regarding Howard, who is a free agent, and Pau Gasol and everything else, the team needs someone to take control and move the team forward.